Fly-luxe is a new formula that allows the solution of the liquid plastic to form the holding helium membrane to dry inside a balloon. Fly-luxe exceeds its counterparts in the flight time by 25%. Before using, read the instructions and warnings, as well as pay attention to the troubleshooting instructions. After inflating Fly-luxe solution requires two to three hours to dry, otherwise it will spray, if the ball bursts. Despite the fact that the solution is not toxic, undried Fly-luxe can damage the surface of the nearest furniture and clothes. Therefore, we strongly recommend to inflate balloons and keep them away from the surface during the first few hours after inflation. If this is not possible, cover the nearest surface with the cloth. When inflating balloons it is recommended to wear glasses to provide additional security, eliminating the possibility of the glue hitting in the eye. Otherwise, immediately rinse your eyes with water for several minutes. Seek medical help if the problem persists. For the bottles with the volumes 4, 2.5, and 0.85 liters attach the dipped tube into the bottom of the container, as shown in Fig. 1. The end of the tube is put over the pin on the bottom of the pump. Lower the pump into the tank and tighten the cap with thread. Pump until Fly-luxe flows out of the spout; along with it it is necessary to place a small container under the bottle’s nozzle. In the first few pumps, there will not be any fluid. Put the balloon on the pump nozzle as deeply as possible so that Fly-luxe solution gets into the balloon. 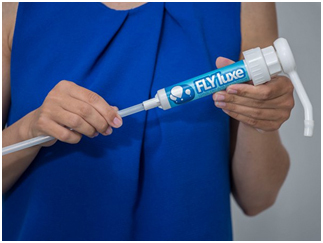 The most important thing when using Fly-luxe is to prevent solution from getting in the balloon’s neck, where a solution can drip on your hands, or in the helium supply nozzle. If Fly-luxe gets on your hands when you tie the balloon, this means that the solution does not get deep enough into the balloon. Press down the pump plunger until it stops, as shown in Fig. 2. So, the right amount of Fly-luxe gets into the balloon, providing the maximum duration of the flight. Make sure that after each movement the pump goes back to its original position. If necessary, before inflation of the next balloon, lift the cover away. Note: It is much easier to pump Fly-luxe if the container is in a warm room. When the pump plunger is in the lower position, remove the balloon from the nozzle. Removing the balloon from the nozzle, hold the neck in such a way so as to remove the remnants of Fly-Luxe solution from the nozzle and prevent it from falling into the neck of the balloon. Gently rub the bulk of the balloon for two seconds so that Fly-luxe solution is evenly distributed on the inside of the ball, as shown in Fig. 3. Along with this, unfold the balloon’s neck upward so the liquid does not hit the neck. Before inflating balloons processed by Fly-luxe helium supply nozzle should be deployed down, as shown in Fig. 4. This reduces spatter inside the balloon. Besides, this liquid does not enter into the helium supply nozzle. Another advantage is that the balloon is located at a greater distance from the face in case it bursts upon inflation. Inflate the balloon until it has a pear-shape form. (If the balloon doesn’t fly immediately it seems necessary to add helium and inflate the balloon to a larger size). Tie the balloon’s neck manually. (Discs and clips do not seal it completely or prevent helium leakage).Leave the balloon, at least for two hours so that Fly-luxe solution has dried; for this move the balloon in the place where the Fly-luxe spatter from the burst balloon will not cause damage. For maximum flight duration the balloons should be in warm or air-conditioned room at a temperature of 22 to 26°C. Warning: Fly-luxe is a non-toxic, water washable plastic material. Although it is non-toxic, keep it away from children. In case of contact with eyes, rinse eyes with water for several minutes.